Goodreads says, "Violet Eden is Grigori - part angel, part human. Her destiny is to protect humans from the vengence of exiled angels. Knowing who to trust is key but, when Grigori reinforcements arrive, it becomes clear everyone is hiding something. Even Lincoln. The only thing Violet does know: Phoenix's hold over her is more dangerous than ever. The race to find the one thing that could tilt the balance of power brings them all to the sacred mountains of Jordan, where Violet's power will be pushed to the extreme. And the ultimate betrayal exposed." Entice starts about a month after Embrace has ended and Violet feels betrayed by Phoenix and unfortunately, she still feels somewhat of a connection to him. Violet is trying to patch things up with dreamy Lincoln and she knows they can't be together, but how she can she deny her heart? Things heat up in Entice and Violet and her friends find themselves on a quest for the "Scriptures" which will help them defeat the exiles. Violet must also be trained in all things Grigori and Lincoln's apartment becomes a new training center for her a few other newbies. As things evolve, Violet starts to question whether there's a traitor in their group, because all clues point to that and in the back of her mind she has a bigger issue to deal with-- she must figure out what to do regarding her feelings for Lincoln. Jessica Shirvington's second book in the series, Entice, is just as captivating as Embrace. This is, without a doubt, one of my new favorite paranormal series. Violet is still trying to figure things out in Entice. She's learning more about her powers, trying to deal with her feelings towards Lincoln, and form new friendships with the other newbies, especially Spence, who she seems to have hit it off with right away. Of course, Phoenix comes back into the picture as he can never seem to leave her alone and this creates some major drama. So, let's just say Phoenix isn't out of the picture. Also, in Entice Lincoln is pre-occupied with his own issues and solicits help from Magda, which irritates Violet tremendously. Deep down she is upset that he hasn't come to her with his major problem. So, in sum, Violet is still trying to figure things out both personally and navigate through life as a new Grigori. The new characters (newbie Grigori that have come to train with Violet) are brilliant. Even though they are secondary characters, I loved each of them, especially Zoe and Spence. I was happy to see Violet form friendships with people other than Lincoln and Steph. Speaking of Steph-- she is still in Entice and is helping out Violet with her issues more than ever. Steph even finds a guy of her own in book two. Yes, there are some unbelievable parts in Entice, like Violet's casual relationship with her dad who is never around, the mystery surrounding the traitor (a tad predictable), and some of the paranormal events; however, I didn't mind it. I was willing to overlook these minor issues, because I love the story THAT much. Another thing I liked about Entice was the fact that there was a lot of action and mystery in it. In addition to figuring the mystery of the traitor, Violet (without her dad knowing!) races to Jordan with her crew to look for the Scriptures. Obviously, new adventures await her in this new setting and I was on the edge of my seat. 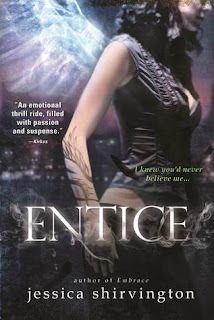 Now that I have read Entice, I am even more excited for the CW to make this series into a television show. I think it will translate really well and will have something everyone is looking for: romance, action, mystery, paranormal elements, and did I mention hot angels? With that said, I can't wait for book three, Emblaze, which comes out in March. Thankfully, we don't have to wait too long! I was able to overlook the minor issues I had with this one as well Christina, particularly the relationship with her dad. I just sort of rolled my eyes at it and then devoured the next chapter:) I adored this book and I can't wait to see what's going to happen with Violet, Lincoln, and Phoenix in book 3! Me too! Definitely looking forward to book three! I loved the new characters that were introduced in Entice. This book shows that this series just keeps getting better! I didn't know the CW was making this into a show... I am definitely excited for that, it would be awesome! I'm with you can't wait for Emblaze to come out.. glad to hear it's not too long of a wait! I agree- the TV show will be great! Thanks for stopping by, Andrea! Love, love, love this cover and the story description! I even saw a review of it today and it seemed it was as awesome as it sounds!